I have a friend who has more energy than the Energizer Bunny. Some years ago, perhaps four years after her aliyah, when I was still living in Baltimore, I spoke to her on a Sunday. "Are you feeling okay?" I asked. "You don't sound like yourself." "I'm so tired, " she said. "Tired? I've never heard you describe yourself that way. Why are you so tired?" "Well, I was up until 3 AM, waiting for my kids to come home." she said, matter-of-factly. I was puzzled. "Why in the world were your kids out so late??" "They were out till all hours with their friends, building bonfires. You know, Lag b'Omer...."
I slapped my forehead with the heel of my palm. If she hadn't told me, Lag b'Omer would have come and gone without me really noticing. And that's when it hit me. Jewish life in Israel really IS richer. The very first Lag B'Omer fire my eyes set upon in Israel, one which I smelled before I saw. Bigger ones came later in the evening, but this was my very first. This year, my first Lag b'Omer in Israel, began right after Shabbat ended. There was an open-air Shlomo Katz/Chaim David concert in the basketball court next to where our shul davens. I walked around with a huge smile on my face, making small talk, astonished at how many people we already know in our new community, and how many of them have ties to Baltimore. Some of our neighbors dancing to the music. 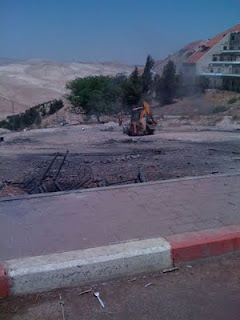 After the concert, we drove around Ma'ale Adumim to see how the bonfires were going in other parts of the city. There were fields and fields with 4, 6, 8 or 10 fires, each a few meters from one another. We must have seen 60 or 70 individual fires on a quick drive through the city. If only my camera was as good as my eyes. In the weeks before Lag b'Omer, we saw kids (mostly boys.... okay, exclusively boys, but I'm sure there were some girls involved too) walking around with, ahem... borrowed grocery carts filled with sticks and broken wooden furniture and anything else that might burn. Notice the stones surrounding the fire to help contain it. This surprised me. People dragged couches, plastic chairs, tables and mattresses to sit by the fire. I'm gonna guess it was mostly the adults who furnished the bonfires. Sorry it's so dark, but can you find the broken down couch and the plastic chairs in the bottom of the photo? ...and even the ubiquitous mangal, which I think is being used here to barbecue potato slices. Yum. I did end the evening with a scratchy throat from the smoke, but there was joy in my heart from so many groups of Jews, gathered together to celebrate with fire, to match the fire in their souls. And in the morning, cleanup begins. I like to write about all the big events in our lives in Israel, especially how we spend our first chagim and other special days here. But there is something more, something constantly in process deep within me. A few days ago, it arose once again. I was at a writers' conference. A writers' conference for women. A writers' conference for English-speaking, religious women in Jerusalem. The conference was a satisfying mix of networking with publishers and published writers, industry information and writing inspiration with a spiritual component. And, in one of the writing exercises, a memory surfaced. I was a preteen. We were living in New York, in a suburban neighborhood where every family owned a more-or-less identical private home. My parents were visiting with neighbors down the street. I was home alone, or perhaps I was the only sibling still awake. While watching TV, a commercial for a denture cleaner caught my attention. I thought about how old people use denture cleaner. Which lead me to thoughts about aging. Which led me to thoughts about death. Before long, I was in a state of sheer terror, because, after death, I couldn't see anything else. At that age (and for more than a decade after), I lived in a godless universe. I had no way to express what was, I realize now, an early spiritual crisis. 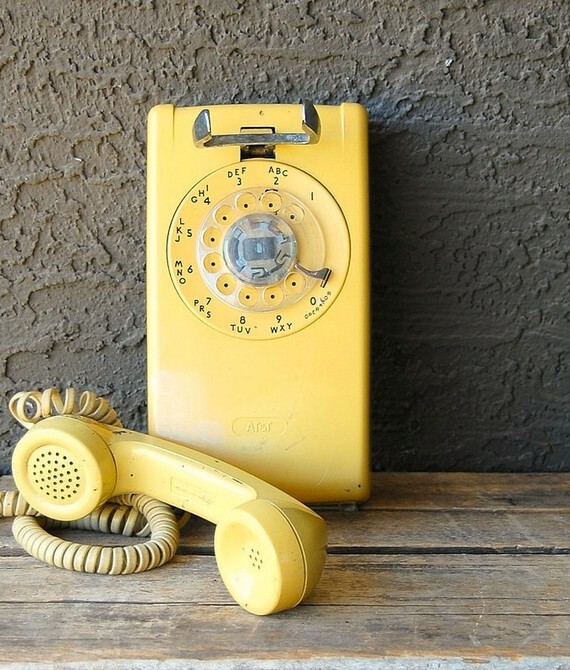 On the yellow wall phone, the one with the long spiral cord, hanging in the hallway outside the den, barely coherent and choked with tears, I dialed our neighbors and begged my parents to come home. Life ends. That realization terrified me, because, in 1971, I was living utterly without God. Forty years later, I am blessed with a spiritual life beyond my greatest aspirations, one that grows deeper each year. Once I located my own soul (not so easy when one lives in a godless universe), the journey began. And that journey ultimately led me to Israel. I am often struck, when friends and new acquaintances tell their stories of how they came to live in Israel, about how we are all guided here. It's as if God handpicks us, one at a time, and sets us on a path toward this place. It has long seemed to me that a significant percentage of olim are either converts or, like me, baalei teshuva. It's as if, having lived lives without God at all, or without the God of Abraham, Isaac and Jacob, making aliyah is simply a natural extension of our spiritual journeys. It isn't always easy to live here. In fact, it's often difficult to live here, at least at this stage of Jewish history. We have many enemies, some from without and, sadly, many from within. But there is an undeniable richness to life here, access to spiritual growth, access to one's own soul, and to God, that can exist nowhere else in the universe. God lives in Israel. And, thankfully, so do I. In the emotional roller coaster that is Yom HaZikaron, Israel's Memorial Day to our fallen soldiers and victims of terror, followed immediately by Yom HaAtzmaut, Israel's Independence Day, there are many tears. Last night, we attended the filming of Tuesday Night Live's Yom HaZikaron shows. Grown men wiped away tears as we watched videos which told the stories of Mikey Levine, a passionate, driven lone soldier who was killed in the Second Lebanon War in 2006 and Avraham Dovid, one of eight boys and young men who were murdered in the Mercaz HaRav massacre in 2008 as they sat and studied Torah. It is a great and weighty privilege to live in this county in which our Memorial Day means so much more than sale prices on mattresses and radial tires. I grew up with the 4th of July of course, but learning about Yom HaAtzmaut was simply not part of the curriculum when I was becoming religious. I first heard the words Yom HaAtzmaut 20 years ago, from a friend who told me about a Yom HaAtzmaut program at her childrens' school. Ironically, that same school, the one where we sent our children when we still lived in Baltimore, just announced that it's closing its doors at the end of this school year. So Yeshivat Rambam is closing its doors next month, and I, who first heard about Yom HaAtzmaut in the context of a Yeshivat Rambam celebration, am living in Israel and celebrating the real deal here. Each time our Shabbat table includes seminary students, here for the year studying Torah, we end up talking about their future plans. When they sit at my table in Israel and say, "I'm going home in X number of months," it makes me cringe, because they still see their homes in someone else's country, even after having the gift of studying and living in Israel for the past academic year. Some people promote aliyah by talking about the privilege of living in Israel, of being part of the greatest experiment in Jewish history in 2000 years. There's no doubt that's true. But there's also the shrinking of the American Jewish community. In some cases, it's not just shrinking, it's imploding. Aliyah isn't just for idealists any more. It's for realists whose eyes are open and who see what's coming around the bend. I am truly, unspeakably grateful to be a citizen of Israel. Tonight, in the early hours of Yom HaAtzmaut, I sat in a huge park in our community, eagerly anticipating the celebratory fireworks. There were 15,000 people at the festival, live music, vendors selling all kinds of glow-in-the-dark chachkes and candies. Sitting there, it was hard for me to wrap my brain around the fact that this precious, special, now 63 year-old country is threatened. It all felt so festive, so joyful, so normal. If anything in Israel can be said to be normal. All around the country are signs of national pride. So many buildings decorated with flags. Flags fly in roundabouts in Jerusalem. Flags fly outside the grocery store. Even the meat counter inside the grocery store displays its patriotism. And at night, there are the lights that celebrate 63 years of a Jewish country. It's irrational, how much I love this country. Happy 63rd Birthday to Israel and all the holy Jews who share this country with my family. Ten months later, I still can't believe I get to live here.